Today I wanted to show you a fantastic makeover done by my childhood friend and neighbour Lisa, who now lives all the way over in the UK. 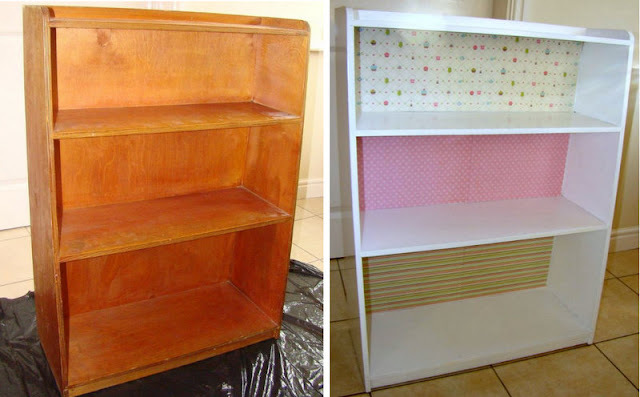 Lisa made over a thrift shop bookcase into a gorgeous creation for her daughter's bedroom. I asked her to send me some pictures and a write a bit about it so I could feature her, thinking I would need to edit it anyway. Well I'm going to use her excellent photos and text as they are. Seriously this girl needs her own blog - you will be very impressed! So he told me to buy the sugar-soap to clean it properly first and then the paint (Dulux Once “One Coat” Satinwood Pure Brilliant White) and a brush. It looks lovely in the gap where her crib used to be, now that she’s progressed to her ‘big-girl-bed’! I hope you enjoyed seeing this inspiring makeover, and a huge thank you to Lisa for allowing me to share. Awww.... I LOVE that bookcase Nats! And even though I was a few years behind you & Lisa @ Park View - I do remember Lisa. We have a fairly new Pine Single bed in our spare bedroom and an antique chest of drawers (good quality). I'm tempted to paint them white and sand them down (like you did with ur kitchen unit - think it was Nats). Just don't know what Dave would say to that ...lol! You are both an inspiration and have got my mind wondering....mmmm.... I'v got itchy hands to do something with our 4th bedroom...lol! Thanks for your lovely comment Marion - Oh paint the bed..... that will be a good first project and you can always antique it to match the drawers. Its so much fun - you will love it!